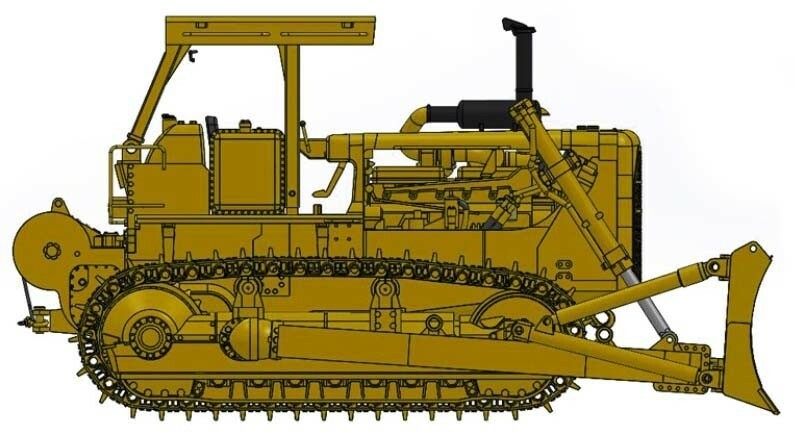 the Cat® D8K will be produced in a limited edition, one-time production run by Classic Construction Models. Produced in 3 configurations, the D8K will be available with: Closed ROPS with U-blade & Multi-Shank Ripper, Closed ROPS with S-blade & Single-Shank Ripper, and Open ROPS with A-blade & Cat 58 winch. Features and details on this model configuration include: • Open ROPS Canopy • Cat 58 Winch • Fully Articulated A-Blade • C-Frame Blade Arms	• Opening Engine Bay Doors • Control Levers & Brake Pedals • Detailed Instrumentation • Access Stairs & Handrails	• Accurately Replicated Exhaust • Realistic Hydraulic Lines • Individually Linked, Free-Rolling Tracks Paint and markings are approved by the manufacturer for accuracy. Includes a signed and serial-numbered spec brochure reproduction.